A delicate prairie bush clover extends its pink flowers toward the sun, like an early settler attempting to plant a flag on a piece of land to call home. 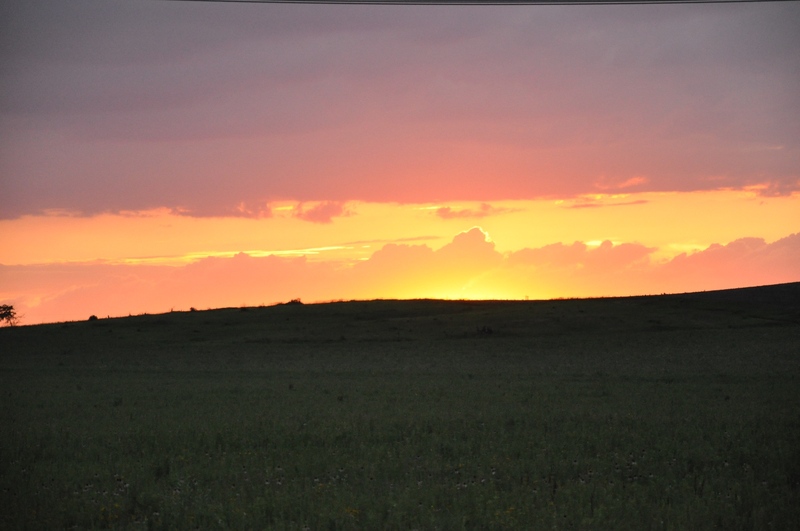 Competition for space is intense where the native herb stands on one of the state’s last remaining prairie landscapes, Nachusa Grasslands, located in north-central Illinois. 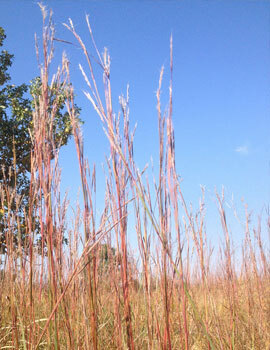 The species’ juvenile plants must establish themselves rapidly to avoid being overtaken by dominant native grasses, such as little bluestem. Even if the wispy young herbs live to maturity, they may still struggle to survive the often deadly wake of litter the grass leaves behind. 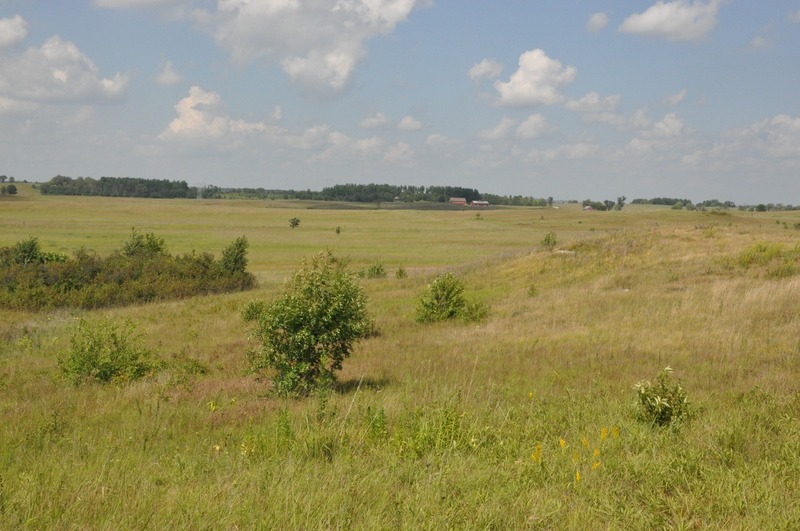 A view of Nachusa Grasslands taken from Dr. Vitt’s field site. Photo by Pati Vitt. Chicago Botanic Garden conservation scientist Pati Vitt, Ph.D., has been studying the rivalry between the prairie bush clover and grass species at Nachusa over the past 14 years. Also the curator of the Dixon National Tallgrass Prairie Seed Bank, she has seen the herb species’ population rise and fall. Prairie bush clover ( Lespedeza leptostachya) grows at Nachusa Grasslands. In Illinois, Nachusa Grasslands is one of the few remaining places where prairie bush clover (Lespedeza leptostachya) can still be found. The issues it faces there are not unusual to the species. After years of working to define the ideal environment for the prairie bush clover and getting to know its adversaries, she feels it is time to bring in the big guys. Bison, 2,000-pound behemoths that are naturally adapted to Midwest weather and vegetation, will soon be arriving to help save the tiny plant. The rust-colored creatures, standing up to 6½ feet tall at the shoulder, are rather particular grazers, explained Vitt. Unlike cows, which graze broadly and without much discretion, bison selectively eat grass. That makes them the perfect friend of the prairie bush clover, which, Vitt has documented, needs a little more room to grow on the limited rocky portion of the 3,000-acre prairie it calls home. Vitt spent much of her summer at Nachusa, a preserve managed by the Nature Conservancy in Illinois. She was hustling to document the status of prairie bush clover populations there before the arrival of a herd of bison in the fall of 2015. Little bluestem ( Schizachyrium scoparium ) is a native grass. Each morning of research she and her team, which included an REU intern, fellow Garden scientist Kay Havens, Ph.D., and additional technicians, were out in the field at daybreak. They worked in teams of two to count and identify all of the plants associated with Lespedeza leptostachya in six plots where it grows. They also took soil samples and did nutrient analysis to measure elements such as nitrogen, phosphorous, and potassium. Lastly, they documented the slope of the land on which the prairie bush clover plants grew, and the aspect—the incline and direction at which they faced the sun. The team spent evenings at their temporary residence inspecting more challenging plants under a microscope to confirm the species identification. All of the data they gathered was recorded into GPS units and later downloaded into a database. What did they find? 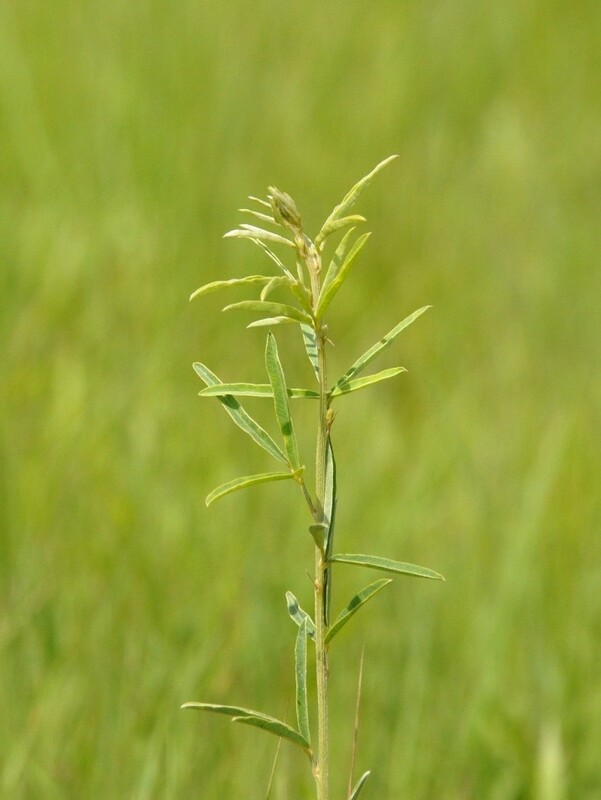 Prairie bush clover performs best in soil that has 75 percent versus 82 to 89 percent sand, though all populations grow on soil with low organic matter. It suffers where levels of grass, and especially the litter the grass produces when it dies back each year, are high. These findings support her research from previous years. Vitt studied the before-and-after status of the species during a one-year trial run with a cow as a grazer. She also investigated the impact of fire as a management tool. “The more [grass] litter there is, the fewer seeds the [prairie bush clover] plants produce, which is both a function of size and probably nutrient status,” she explained. “Litter may not only serve to suppress the growth of the plant, but because it is carbon heavy it may actually decrease the available nitrogen in the soil.” One of the benefits of prairie bush clover, she theorizes, is that the healthy plants add nitrogen to the soil. That is an asset for surrounding plants. 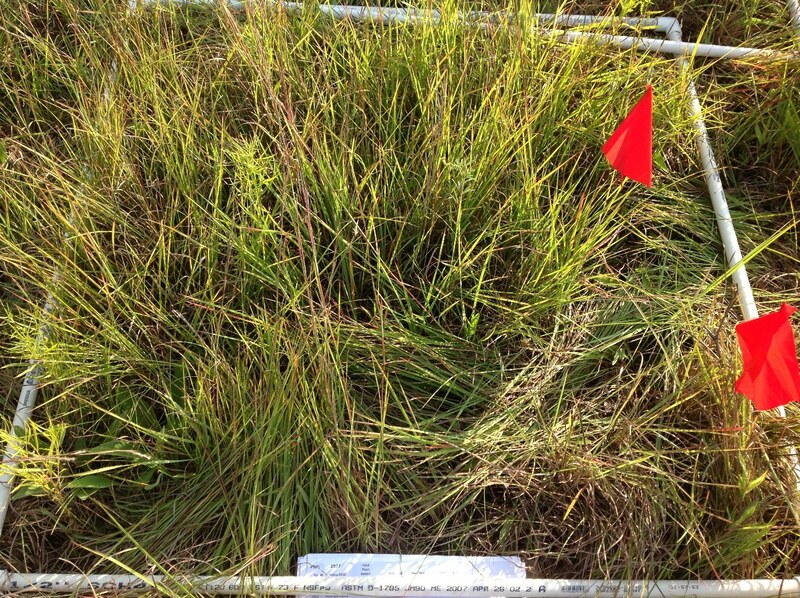 A research plot where little bluestem is growing over smaller prairie bush clover plants. Photo by Pati Vitt. When alternated with fire, grazing is a natural and effective management tool, noted Vitt. Fire, she explained, decreases the biomass of grass above soil, resulting in less grass litter. At the same time, it encourages new growth by stimulating meristems in the roots below the soil—areas where new cells are produced. After fire, said Vitt, clumps of grasses such as little bluestem (Schizachyrium scoparium) tend to be larger. However, when they are also grazed, those clumps are less dense, and therefore less discouraging to growth of the prairie bush clover. Bison will soon graze the vast prairie. Photo by Pati Vitt. Vitt is back at the Garden now, sorting through the data she collected this summer and writing about her findings. These data are essential, she said, because she will be back to check on the prairie bush clover after the bison have settled in. She is also planning for future experiments, such as building habitat models for prairie bush clover using remote sensed data. For a little plant that exists in only four states and is federally threatened, a hero can come in many forms.